It’s Wine and Chocolate Days in San Benedetto, and paranormal museum owner Maddie Kosloski has sweet dreams about her new Magic of Chocolate exhibit. Her latest attraction is a haunted Mexican whisk called a molinillo that rattles if someone lies. 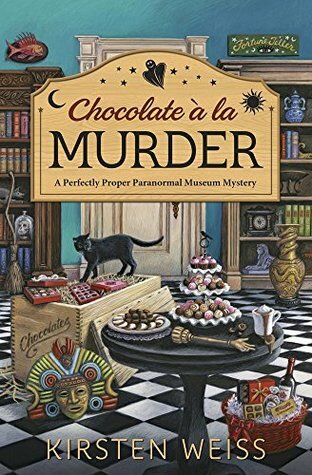 When Maddie visits the town’s new boutique chocolate shop, she finds one of the owners dead and covered in melted cocoa. Maddie’s determined to catch the killer, and she soon uncovers deadly dealings in the world of artisan chocolate. But the deception surrounding those dealings are enough to make the molinillo rattle all night. Will Maddie have to temper her passion for sleuthing before a killer makes her fate a bittersweet one? The Bottom Line: With each installment of this series, I think “San Benedetto can’t get any weirder!” And yet, it does, and this is why I love this series so much. Maddie is undoubtedly the center of this wonderfully weird universe and hovering around her is a cast of characters equally weird and delightful. With each new book, all the core characters are showing growth while remaining true to their essence; this is one of the things I am most fond of in my books and it is a strong element in this series. Of particular note in this book is the ending which I enjoyed tremendously because when the big bad and the motive is revealed, I remember thinking to myself, “WOW! They even kill for weird reasons in this series. AWESOME! !” In all, the relationships are growing and expanding, the paranormal museum is picking up in terms of business, Maddie is getting far better at investigating, and the future of San Benedetto is poised for even more weirdness.